Governor Andrew M. Cuomo today announced the number of craft beverage manufacturers has grown by 50 percent since the enactment of the Craft New York Act three years ago. A direct result of the Governor's Beer, Wine, Spirits and Cider Summits, the Craft Act went into effect on December 13, 2014, continuing the state's support of the growing craft beverage industry. Since then, 340 new craft beverage businesses have opened their doors across the state. 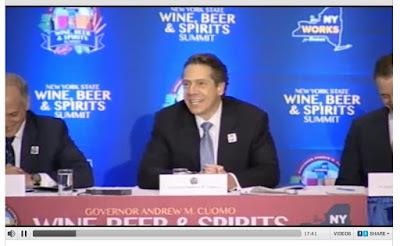 "This administration has worked hard to cut red tape, lower costs and roll back burdensome regulations for New York's craft beverage industry - efforts that are clearly paying off in every corner of this great state," Governor Cuomo said. "I'm proud of the continued growth of this sector, which has created jobs, spurred tourism, supported New York farms and led to the creation of top-notch world-renown products." Under Governor Cuomo's leadership, New York State has implemented a series of legislative and policy changes to capitalize on the soaring consumer demand for locally produced craft beverages and to make it easier to open and run a craft manufacturing business. These improvements include lowering taxes and fees, providing support for research, creating new licenses for farm breweries and cideries, rolling back restrictive regulations, cutting the time it takes to obtain a license in half and overhauling the state's antiquated Alcoholic Beverage Control law. The 2014 Craft Act cut burdensome requirements placed on producers and eased restrictions regarding the marketing of craft products by: relaxing rules for conducting on and off-site tastings and sales; providing additional opportunities for small manufacturers to reach new customers; increasing annual production limits while keeping licensing fees low; allowing farm distilleries to open a no-fee offsite branch location; and launching a $2 million Craft Beverage Marketing and Promotion Grant Program and a $1 million Craft Beverage Industry Tourism Promotion Grant. Since the Craft Act went into effect, New York State has experienced unprecedented growth in craft manufacturing, with an average of over two licenses issued each week for new breweries, distilleries, wineries and cideries throughout the state. In the three years since the Craft Act was enacted, 35 cideries, 60 wineries and farm wineries, 67 craft distillers and 178 craft breweries have opened for business in the state. Of those 340 new businesses, 260 are farm-based producers that use locally sourced ingredients in their production. The number of craft beverage producers has increased in every region of the state since the signing of the Craft New York Act. Regional highlights can be viewed here. New York State now ranks in the top five in the U.S. for its number of craft beverage producers in every category. The state ranks fourth in the country for both the total number of wineries and the total number of breweries, second in the country for the number of craft distillers and first for the number of hard cider producers. New York State Liquor Authority Chairman Vincent G. Bradley said, "New York is being recognized across the country and across the world for our high-quality craft beverages. Governor Cuomo has fostered an environment in the state that allows these businesses to succeed and grow, and because of this, more and more producers are opening and contributing to the economy." State Agriculture Commissioner Richard Ball said, "New York's craft beverage manufacturers are smart, innovative entrepreneurs with a dedication to excellence, and it shows in their products. As the industry grows, we are seeing more and more producers using local ingredients straight from the farm, which is beneficial to our agricultural sector and the regional economy. Because of Governor Cuomo's efforts to kick-start the industry, it is thriving and making a strong impression locally, nationally and around the world." New York State Wine and Grape Foundation President Sam Filler said, "The Craft New York Act helped expand market opportunities for New York State wineries by permitting sales by the glass at all other farm beverage licenses, and in effect, fostering collaboration and relationships between the wine industry and beer, cider and spirits producers." New York State Brewers Association Executive Director Paul Leone said, "As we celebrate the 3rd anniversary of the Craft New York Act, we need to look at far we've come in these few short years. Simply allowing breweries to serve beer by the glass in their tasting rooms has been a game changer for the craft brewing industry in New York State. Not only did it provide breweries with a critical revenue stream that allowed further growth in the hiring of more employees, but also in expansions and infrastructure. Add the enhanced tourism aspect, and you have the perfect storm of economic growth from all 4 beverage sectors. 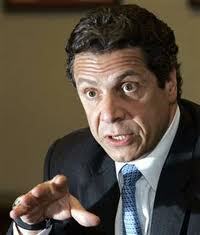 We thank the Governor and his administration for supporting this critical piece of legislation." New York Cider Association Executive Director Jenn Smith said, "By modernizing the regulatory atmosphere around the production and sale of craft beverages, supporting the growth initiatives of individual orchards and cideries, and nurturing collective promotional programs such as our Cider Week festivals, Governor Cuomo's Craft Beverage Act has made New York a fertile and prosperous environment for the farms and entrepreneurs making cider from New York apples. As a result, New York now leads the nation in number of cideries, and New York Cider is recognized internationally as a beverage of diversity and distinction. Our industry's advancement is an outcome of his vision." New York State Distillers Guild President Cory Muscato said, "Having now been three years since the passage of the Craft Act, it is even more obvious how much this bill meant to New York's distilled spirits industry. A majority of our membership and industry have made significant investments in their own businesses due to the passage of this bill, including new tasting rooms, production facility equipment, and personnel. We can proudly serve our spirits alongside fellow New York-produced beer, wine, and cider by the glass, opening market access for producers which leads to more opportunities for growth. A tremendous thank you to Governor Cuomo for his leadership in making New York State the poster child of the nation's successful craft beverage industry." Senator Rich Funke, Chair, Senate Cultural Affairs, Tourism, Parks & Recreation Committee said, "The innovation and development of New York's craft beverage industry in recent years has been vital to tourism throughout New York State, especially in the Finger Lakes Region. Whether it is agri-tourism farm visits, tastings at local breweries, or concerts and other events that draw people to New York this growth is a crucial element to many of our local economies. As Chair of the New York State Senate's Tourism Committee, I look forward to continuing to work with my colleagues to support the advancement of the craft beverage industry." Senator Patty Ritchie, Chair, Senate Committee on Agriculture, said, "Each and every day, New Yorkers are looking to eat—and drink—locally made products. The potential of our craft beer industry is unlimited. With every step we take in unlocking that potential, we are not only supporting the industry, we are also creating jobs and boosting the bottom lines of our hardworking farmers. In recent years, I have been proud to spearhead changes that make it easier for our state's craft beverage producers to flourish and look forward to the continued growth of this booming industry." Assembly member Daniel J. O'Donnell, Chair, Assembly Committee on Tourism, Parks, Arts and Sports Development said, "The flourishing craft brewery industry is a major win for all New Yorkers- farmers, consumers, tourists, upstate, downstate- and beyond! I'm excited to see the continued success of these businesses and the communities that they support as the industry expands over the coming years." Assemblyman Bill Magee, Chair of the Assembly Committee on Agriculture said, "The Craft New York Act has bolstered the craft beverage industry through legislative reforms of regulations, easing red tape and increasing interest in brewing craft beverage products, and adding new market outlets, allowing these businesses to become major contributors to our agricultural and tourism economies, and creating new jobs and opportunities across the state." The changes have not only ushered in an explosion in the craft industry, but have also generated employment and economic development for supporting industries, including bottling, construction, freight, printing and advertising. New York agriculture has benefited directly from the Farm Brewery and Farm Cidery legislation through increased demand for locally sourced farm products. According to Cornell University, the acreage of hops grown in New York State has nearly doubled from 2014 to 2016, and the acreage of malting barley has increased by 374 percent in the same two-year time period, from 422 to approximately 2,000 acres. At the same time, to the growth of agritourism in the craft beverage sector further bolsters New York's massive $100 billion tourism industry. Let's start the conversation like this.... Tousey Winery is one of the best quality wine producers in the Hudson Valley. End of conversation....except....that's not quite true... you see, they're actually getting better....which is quite astonishing, when you figure that they started off pretty great. I have known Ben and Kimberley Peacock at Tousey Winery for many years now. And I have always been impressed with their winemaking. Ben took the study of winemaking and viticulture very seriously. He studied under Peter Bell in the finger Lakes and worked with Steve Mudd in Long Island. That's an impressive coaching tree in reverse. So you're thinking he would know how to do his stuff. Kimberley meanwhile is a ubiquitous presence on the farm market and promotional scene in Columbia and Dutchess counties. First of all, the tasting room at Tousey has been completely reconfigured for a bigger, bar, able to accommodate more folks! They've also added a communal table to the place to add extra space for those hanging around a bit. And they've added taps and are selling local brews by the glass. But the real point of this article is the wines. They're always been terrific. Now they are getting great! The Tousey Estate Grown Pinot Noir 2014 is a fantastic wine that leads off it's attack with a cherry explosion of bright young red cherries, and dark sour cherries layer on on top of the other, along with lovely light strawberries. Classic notes of lavender and vanilla also come to the fore. This is easily one of the best Pinot Noirs made in the Hudson Valley, and really should be considered in any conversation about New York state Pinot Noir. The next wine that was even more of a revelation was the Tousey Estate Grown Cabernet Franc. First off,it's as dark as I have ever seen a Hudson Valley cab franc. And the color is matched with unprecedented taste. Big smacks of dark cherry and young cherry mash together with red raspberry and hints of cassis. It has layers of flavor with mocha and cocoa and graphite and vanilla all blending together. Well balanced with fruit and tannins Great structure. Easily one of the best Cabernet Francs I've had in New York state. Amazing! Tousey The Loic Blanc de Blanc Inaugural Vintage 2011 was also a very especial wine. This first premiere in December of 2016. Mae from 100% whole cluster Chardonnay grapes, the whole thing i pressed at 34 F with the idea of preserving the freshness of the fruit. This sparkling wine is made with the methode champenoise method, and take three years to mature in the bottle. Peach and green apple and fresh apple all compete with other tropical notes and are swirled in hints of bread and spice. The wine ends with great acidity and a hint of creaminess. A very very excellent sparkling wine! But what's that name from? Ben Peakcock retells the story, "It’s a long story. The name comes from a French chap who was AWOL from the French Foreign Legion. I went to Danish school with him and we became friendly. I invited him over to dinner and he revealed all his woes. AWOL, married a Danish chick but she’s doesn’t love him, probably going to get divorce etc, etc. "Tiger was only a baby back then. For reasons unknown, he told us his father had an embroidery business in the south of France. A week after the dinner a towel arrives with a tiger on it for the baby! We never saw him again. Fast forward to 2012 and we’re searching for baby names. Kimberley suggests Loic. And I say, no way am I retelling that boring as hell, random towel story for the rest of my life.... I lost." Again, I will say it, Ben Peacock and his wife Kimberly are producing extraordinary wines. One must simply go to Tousey. Period. And you MUST do two things: taste the wines, and secondly, pretend you don't already know the story about Loic, and get Ben to tell it again! 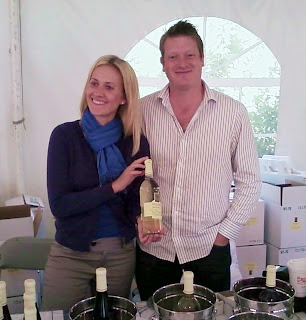 I first discovered Galway Rock Vineyard and Winery at the Troy Farmer's Market in Troy, NY. Kate and Ryan Taylor were inspired by the Garagistes of France. "Building on this momentum, we are hoping to bring the best of the Garagistes movement to the foothills of the Adirondacks. Our main goal is to produce the highest-quality grapes and wines on a small-scale, integrating ourselves into the collective conscience of our regional community," states the website. According to the website, "Before returning to upstate New York to found the Galway Rock Vineyard and Winery, Kate garnered years of experience in the wine industry to hone her winemaking skills. ...Kate deals on a daily basis with headache-inducing compliance work, tedious financial management, and navigating life...Originally volunteering as an unpaid laborer with Whitecliff Vineyard and Winery, she was quickly promoted to assistant winemaker in recognition of her dedication, intelligence, and work ethic. Under the tutelage of Michael Migliore, Kate developed her winemaking skills and took a prominent role in crafting several award-winning wines. After a string of successes, Kate struck out on her own to become the head winemaker of Kickapoo Creek Winery, a small family-owned organization in Edwards, IL." "Ryan has always maintained an appreciation for the complexity of plants and passion for growing them...After years of tinkering, Ryan started a horticulture business that delved into several aspects of the industry: market gardening with hydroponic and organic methods, manufacturing hobbyist growing systems for retail sales, and offering consulting services to local growers and product testing for larger companies. As his cumulative knowledge and experience grew, he became a recognized expert in the field and began writing feature articles and a monthly column for the international hydroponics trade magazine Maximum Yield." Together, they founded Galway Rock Vineyard & Winery in Ballston Spa, and the winery is a member of the Upper Hudson Valley Wine Trail. I first tried the Galway Rock Rockslide White Table Wine a semi-sweet light white made primarily from Cayuga. This is a big fruity wine, but with enough acidity to keep the final wine honest, crisp, and elegant. Big fruit up front and a hint of sweetness, but righteous acidity. Very very good! Galway Rock Chardonnay Riesling 2015 was white wine blend of 90% unoaked Chardonnay and 10% Riesling. This was extremely lovely. Big tart apples and pears, hints of lychee, and other exotic tropical fruits, and all with a zippy acidity that made it fantastic! Loved this wine! Galway Rock Merlot-Malbec 2015 was a light-to-medium bodied dry red table blend of Merlot-Malbec. Cherry, tobacco, and pepper all came through in this lovely, quaffable red table wine. A nice spiciness of the finish and a balance of acidity and tannin made gave it nice complexity. Very, very nice. There's no question that Galway Rock intend to be a focused producer of quality wines in New York state, and is an excellent addition to the Upper Hudson Valley and Hudson Valley in general. Weis Vineyards is a Great Addition to the New York and East Coast Wine Community! While at the Finger Lakes wine festival in July of 2017, I stumbled upon a label that was new to me: Weis Vineyards. Curious, I stopped and chatted with the winemaker. Born in Zell Mosel, Germany, Winemaker Hans Peter Weis traveled to the United States on a quest to pursue his passion and discover the world. However, his travels were cut short when he stumbled upon his home away from home in the Finger Lakes region of New York. Finding the minerality of the soil and climate similar to that of home, he was able to pursue his passion of handcrafting traditional German style wines. In May of 2017, Weis Vineyards opened their doors.As Paul Vigna wrote, "After 11 years of working locally as a winemaker, he and his fiancee made the decision to open their own location and have not looked back. "We are dedicated to providing exceptional, high quality, German-style wines, as well as high quality customer service," Weis says. "We want everyone who walks through our doors to feel comfortable and at ease while enjoying the wines we worked so hard to create." They bought the old Lime Berry Estate in Hammondsport and began transforming it into a classic German styled wine producer. The early results have been astonishing! They offer eight whites, a rose, and one dry red. At the 2016 New York Wine & Food Classic Weis won "best cold climate white varietal" and a double gold rating for their 2016 Heart of the Lake. They entered seven wines, and all medaled, several taking home gold. In tasting the wines, I realized almost immediately, that they were excellent and of good quality and flavor! I first wine I tried was the Weis Gewurztraminer 2016. I loved this wine right off the bat! Super aromatics! As promised, the melon, lychee and rose pedal aromas all came to the forefront. Great zesty acidity and a touch of lime/grapefruit at the end. Exquisite! The Weis Dry Rose 2016 was also fabulous. It has big hints of fresh strawberries and bright young sour cherry, with notes of vanilla and lime A classic clean, spritly dry rose. The Weis Gruner Veltliner 2016 was also something of a revelation! Delicate, minerally, with great zesty acidity, it was topped with tropical fruits and lemon and lime. A lovely, lipsmacking finish! The Weis Semi Dry Rieslign 2016 was also impressive. Peach and apricot come through as promised with hint of honey suckle and starfruit(?). It's had a nice touch of minerality to it, and a bright acidity which kept this lovely, light, and delicate wine honest - as a classic elegant version of this style of the varietal wine. Lovely structure and complexity and balance. Weis Vineyards is not only an excellent addition to the Finger Lakes wine scene and a lovely addition to New York state wines, it is a feather in the cap of east coast wine making. Very exciting!